Vinnfier FlipGear Tango 212 WM comes in a big packaging. Yes, it is a big portable speaker for sure. And have some weight too so there is retractable trolley handle for you and me. 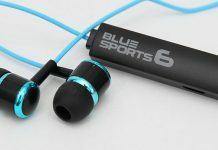 Besides speaker, there are free wireless microphone, AUX cable, 2-pin AC power cable and user manual. As usual, the wireless microphone needs 2 AA size batteries (not included). Build quality is excellent all thanks to solid and sturdy ABS plastic chassis. The main 8″ speaker driver is covered with metal grill while the 1″ tweeter is located on top of it. 7 colours pulsating LED is located on the main driver. Besides the trolley handle, there is another fixed one to carry Tango 212 WM. Weight around 3 kg by the way. Yes, there is a pole mount for blast at higher place too. And the wheels for troll around here and there. 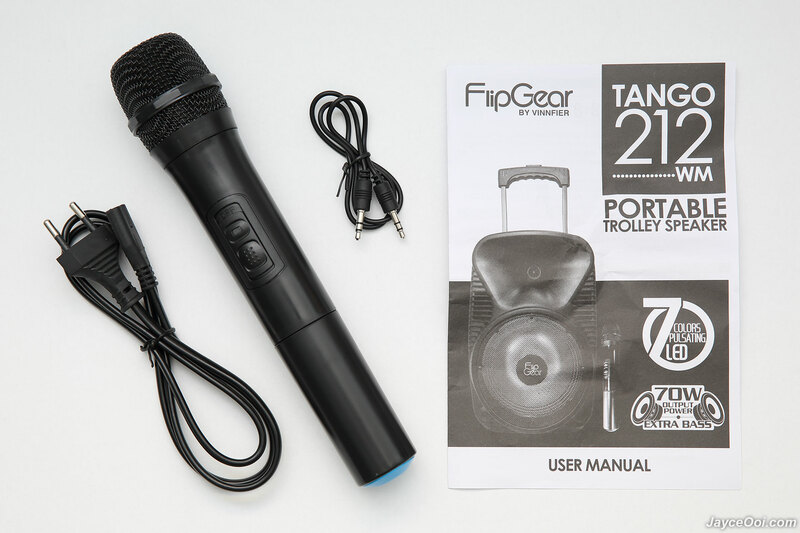 Vinnfier FlipGear Tango 212 WM surely is a powerful outdoor speaker thanks to 70W output power. More than enough to blast at large living room or tuition center. Even on outdoor party. Thanks to treble and bass volume control, you can change sound signature according to your taste and preferences. Yes, it does have bright treble thanks to dedicated tweeter. For those who loves sparkling bright treble will surely like it. Bass is there but not subwoofer kind of power. Overall, Tango 212 WM sound great for the price. It is using basically the same wireless microphone as FlipGear Tango 202. Yes, is has outstanding wireless range – up to 10m even with obstacles like walls. No disconnecting issue here. The dedicated microphone and echo volume controls help to make it useful and fun too. However, the built-in microphone amplifier is average at best. Therefore, you need to put mic close to your mouth in order to get clear voices where the background music is louder. How is the battery life? Around 6 hours non-stop music playback. As usual, tests were done on average room sound level with LED lights turned on. And it takes less than 2 hours to fully charge. Colourful LED lights are great for party. You can turn it off if you don’t like it too. Powerful portable trolley speaker with nice sound. Period. Yes, that’s Vinnfier FlipGear Tango 212 WM. Be sure to check out Vinnfier Website for details. Get yours at Lazada.